Whether you are instructed to put the strings in the front or the back of the faded, wrinkled, rag of a gown, if there's one thing you won't have once you've donned the thing, it's your dignity. An interior designer named Mary Hogan, inspired by a young friend undergoing chemotherapy, recently designed a garment that would make any patient comfortable and dignified, even while wearing it with a pair of jeans on his way to treatment. The unisex Medical Dignity shirt has just been patented and is being sold online in sizes to fit men and women, children, and even toddlers. 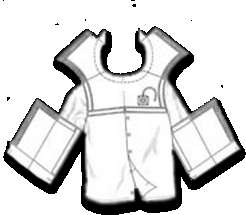 The shirt, currently made only in white, is comprised of multiple panels that can be lowered or completely removed from their Velcro closures. 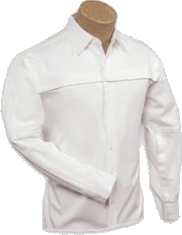 Purportedly comfortable, easy to wash, and easy to use by caregivers, the Medical Dignity shirt is practical as well as dignified. The Medical Dignity shirt is also needed in hospital settings by in-patients, as well as by bed-ridden patients receiving care at home. Hospital gowns may be more colorful than those we wear at the doctor's office, but no more dignified. Caregivers might, for example, cleanse a patient's wounds on one part of her body without removing her entire gown. You won't likely see Hogan's Medical Dignity Clothing when you go for your regular medical checkups yet, but maybe some day.... Meanwhile, Hogan is busy designing more dignity clothing for her line. Currently you can purchase the Medical Dignity shirt from the corporation's website or by other means provided on the site.